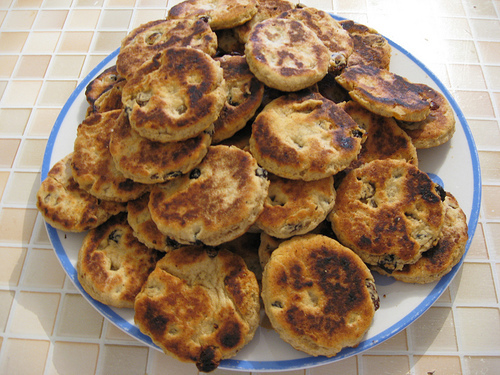 Welsh cakes are simple to make and have a wonderful taste which belies the simplicity of their ingredients. The cakes are cooked on a flat griddle, and not inside the oven. 1. Rub the butter into the sieved flour to make breadcrumbs. Add the sugar, dried fruit and then the egg. Mix to combine, then form a ball of dough, using a splash of milk if needed. 2. Roll out the pastry until it is a 5mm/¼in thick and cut into rounds with a 7.5-10cm/3-4in fluted cutter. 3. You now need a bake stone or a heavy iron griddle. Rub it with butter and wipe the excess away. Put it on to a direct heat and wait until it heats up, place the Welsh cakes on the griddle, turning once. They need about2-3 minutes each side. Each side needs to be caramel brown before turning although some people I know like them almost burnt. 4. Remove from the pan and dust with caster sugar while still warm. Some people leave out the dried fruit, and split them when cool and sandwich them together with jam.